Here's how you can get MYOB and Timely working for selling and redeeming gift vouchers and customer credit. Check out this guide for more general information on how liability works in Timely. 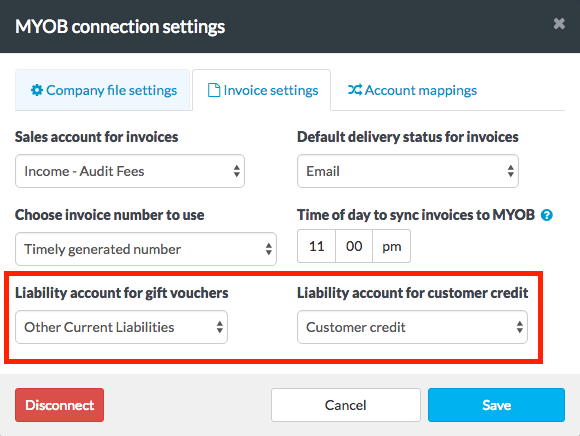 Note: When customer credit, or a gift voucher is redeemed, this will reduce the amount of liability in your mapped liabilities account. Gift voucher or customer credit redemptions, are never treated as revenue. Instead, they simply add to, or reduce, your liability. Head to Setup > Add ons and Configure MYOB. Click Save to update and apply.